This design features common retro shapes used in the scrap booking/stamping industry, a ribbon for the menu, and subtle patterns. This Wordpress Shop theme would be ideal for an online shop selling 10 to 50 products, an at-home / small business, or anything you feel would suit the design style. This WordPress theme comes with a bonus simple shopping cart (worth $9 here) and a bonus newsletter plugin (worth $25 here)! 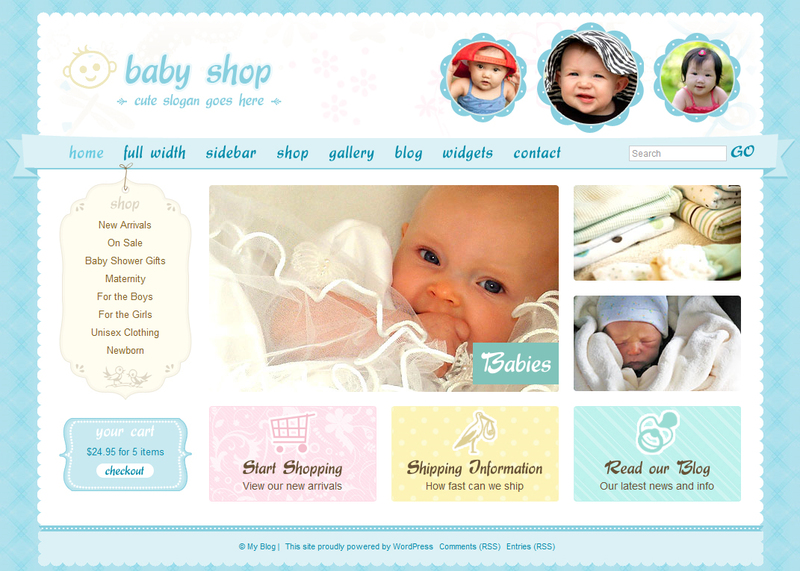 This Cute & Sweet Wordpress Theme has been modified by various web developers to suit their customers needs. Below are some examples of these modifications. If you have used this theme and would like it listed here please let me know. Here?s a quick run down of the features, please look through the screenshots to see the (easy to use) backend wordpress options and to get an idea of all the features this template has to offer. Select your logo image, and what images to display in the 3 flowers all from wordpress (upload a square image). Also control where each image links. Edit in wordpress the graphic buttons, Control the text, the button text and the icon file. Select which images to appear in the slide show, the text to display, which page to link to or turn the slider off completely. The shopping cart has many options best described in full here. It is a fully working cart with checkout and payment options. You can choose to display ?latest products? and ?specials? as widgets. All products are added and edited in WordPress. Send bulk emails to your existing wordpress user database, all controlled from inside WordPress. 7 Custom Widgets: random product ?specials?, random products, subscribe to newsletter, product categories, latest newsletters, your cart, pretty menu (tag side bar). Custom post types for Products, making it super easy to add these to your blog. Google Map and driving directions on the contact page. Built in contact form (with re-captcha capabilities). 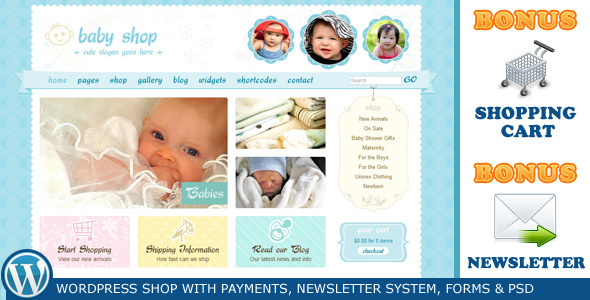 This wordpress shop is designed to be a ?simple shop?. It is perfect for the startup business with 10 to 50 products (however there are no limits to the number of items you can have in this shop, add 1000 if you want!). This shop is simple and therefore will be easy for your customer to use. There are no plans at this stage to add additional features to the shop (such as vouchers, shipping calculators, discount tools, different payment gateways, multiple product attributes, stock control, order history, customer history, reporting, etc..) Please consider if this shop suits your needs before purchasing. If I do add more features to the shop over time I will post them here to let you know. The email newsletter plugin is an advanced bulk emailer designed especially for Wordpress 3. It is very easy to use and feature rich. Heaps of features which allow you to quickly send professional newsletters to your existing wordpress user database. More information about it?s features here.